So yesterday I posted my Wordless Wednesday picture. And I chose to not say anything. 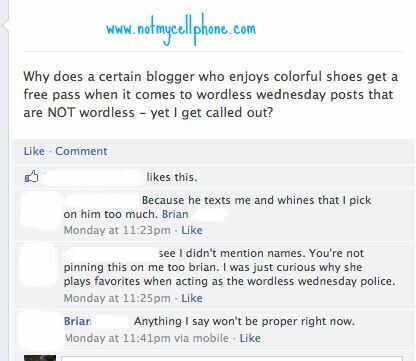 Apparently I get yelled at for using my words on Wordless Wednesday. I think using my words is a good thing. So yes, the story behind the picture. I love my Dexcom, maybe the fact that I keep “breaking” it, shows just how much I love the dang thing. I have had my Dexcom since November or so and have managed to need to replace it four times. FOUR TIMES!!!!! This post outlines my first break on some level. I didn’t actually read it, I bore myself apparently… Just kidding. I did like that post. The writer is amazing. Sorry, I distract myself. Bad Brian, no cookie. Anyway, so the first time I broke the Dexcom, I was sad, but hey weird stuff has been known to happen around me. The next time I broke my Dexcom, I was in Florida with Sara when I noticed some peeling around the door casing. A week later the door decided it was done and ran away on me. I called tech support again, apparently this issue has happened to other people and wasn’t just me. So they sent me number three. Well that was all good for about a month. I was very nice to B.A.S.C. number three. I made sure to baby it, I did not want to leave it alone or let it get hurt in anyway. So it was kinda surprising to last week see, that once again the door decided to run away on me. I was kinda sad. This time I took more drastic measures to protect B.A.S.C. I ordered a Tallygear Dexcom Case. Will this work? I have no idea yet. I mean it does offer just a little more protection for the receiver. I was hoping Dexcom would eventually release a silicone sleeve, kinda like what they did for the Seven Plus, but it does not exist yet. I am hoping though this new case will be something to cushion the CGM if it falls. Mind you the worst amount of falling the last version of my receiver did was the normal bed time jump from bed to the carpet floor. I kept telling it no more Dexcom’s jumping on the bed, but apparently it has decided to ignore me for now. Here’s hoping number four lasts me for more than a month. The good news the warranty has been great and I have a new receiver that will hopefully take me well past my warranty period now. It’s your blog, you can use words if you want to. Heck, you can do anything you want as long as it’s not illegal or immoral. My Wordless Wednesdays are often quite dirty. Wordless Wednesdays are fun but Ive never been much of a rule follower and a certain friend has called me out on it a couple times (out of fun which is one of the many reasons I adore this friend) In fact at one point during a text conversation I told her rules were meant to be broken – well my daughter typed the text for me since I was driving. Her response to my daughter (she knew my daughter was typing my messages) was to remind me of my words next time she (my daughter) broke a rule. Again I adore this friend. You may have got sucked into an ongoing jest. Just so you know i only pick on those I have a great deal of respect for. Relationships are not built with “likes” “shares” “follows” and “friend requests” – they are built within the conversations between them. I am thankful for all the words that make up those conversations. Rules are meant to be broken. I am fine with being dragged into the middle of things. I also have no fears of dragging people right back under da bus myself! Come on we spoke about cans of poop earlier this week. Nothing is Sacred for me… Wait no, that’s not true. #awkward #notontwitternohashtags #reallyawkwardnow.